Guernsey is the second largest island in the Channel Islands, located in the English Channel Sea just off the coast of Normandy in France (no, I don’t speak French!). On a clear day you can actually see the coast of France from the island. Summer 2017 has been a special summer for me because that’s when I started teaching myself photography and editing skills and set up the @whats_up_beaches Instagram account – click here to see it! 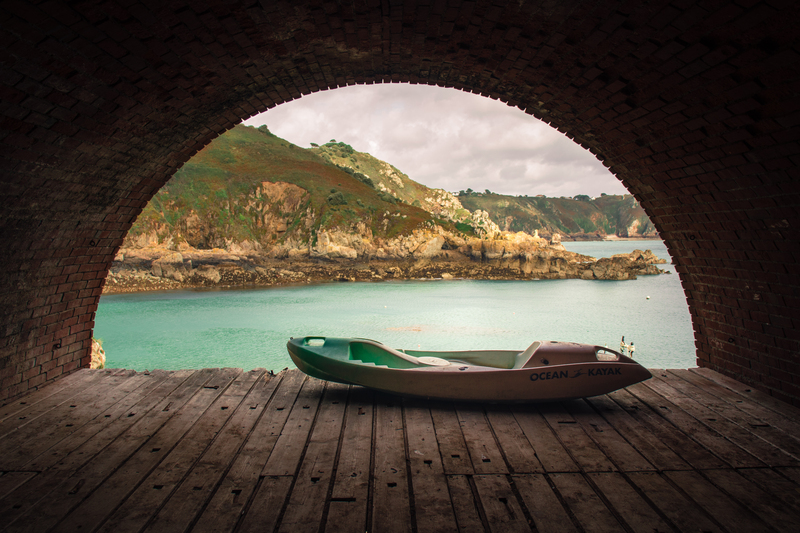 The picture above is taken at Saints Bay – this has to be one of the most photographed locations in Guernsey and I’ve been there twice this summer to get the same shot! This picture was taken the second time I visited and we were lucky to find some kayaks on the platform which were perfect props for my shots. Summer in Guernsey is amazing! We have such amazing beaches and cliff paths and I’ve explored so many new places I’ve never been to before despite living on the island since 2008. This photo is from a trip to Petit Bot, a beach on the south coast of Guernsey. We went to Petit Bot to explore in the caves which have formed to one side of the beach. We found loads of caves and rock pools and wanted to stay longer but we couldn’t risk the tide coming back up and trapping us on the rocks. I’ll definitely be going back there again to explore some more. I was lucky to have a visit from an old friend from university this summer so what better way to get the experience than to grab fish and chips and head to the beach for the sunset. The sunsets this year have been incredible! We are so blessed to live in such a beautiful island. I spent many evenings this summer down on the west coast trying to capture that perfect sunset scene. I’ve shared a few of my favourite images from various shoots below. Earlier this year I joined forces with some of my friends at Silverback Sunglasses – a Guernsey based company selling sunglasses and other accessories. You can shop the range here and use code AMEMAL at the checkout to get 10% off all purchases! Where to visit: Hit up Cobo Beach for the dreamiest sunsets and grab a pint of the local beer Breda at the Rockmount while you’re there. Check out the Little Chapel, a tiny church covered in pottery tiles and leave a comment in the guest book. Where to eat: Red in St Peter Port is one of the best places to grab a great steak plus there’s a newly refurbished cocktail bar upstairs to finish off your dinner with a freshly made Mai Thai! Octopus, also in St Peter Port right on Havelet Bay, is also very good for seafood and steak and is one of my favourite restaurants. It’s beautifully decorated and fantastic for a summer lunch or evening meal with a drink on the terrace. That’s all from me for now – I hope you enjoyed my first ever blog post! Leave me a comment if you have any questions or tips for my next post!